You cannot have a party without a cake, and if it is a boy's party, why not make it a Blue Cake? Our Blue Cake bounce house is a very attractive ride that is sure to excite every little boy. Complete with candles and balloons, the Blue Cake bounce house is designed to stand out anywhere. Everyone can enjoy this 13'x13' Blue Cake as a great source of fun and even exercise. Up to five riders can enjoy the Blue Cake at once. 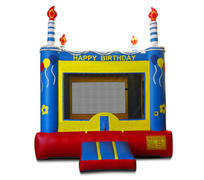 Everyone is sure to enjoy a classic bounce house at any event, and the Blue Castle is a great item to offer.